Hamilton's line of CLD watches was introduced in 1948 with the Brandon, Langdon and Nordon models. Additional models were introduced over the next several years. 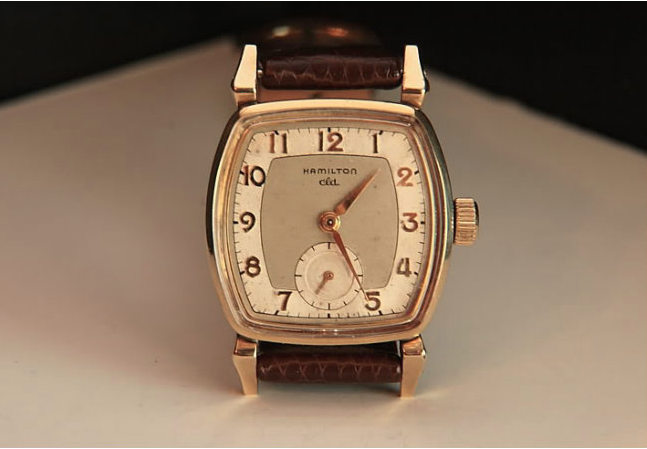 There were a total of 17 CLD models in all, including solid gold and automatic models. In 1951 Hamilton introduced the Beldon CLD model. It was produced though 1955. Like all CLD models, the Beldon featured a series of gaskets around the crystal, bezel and crown to protect the watch from dust and moisture. The 10K gold filled case is prone to wear on the lugs and it's not unusual to find Beldons with all sorts of bumps and bruises to the lugs. The case is a two piece design where the movement is contained in the case back and is accessed by removing the front bezel. It has a two-piece stem to allow the movement to be pulled out the front. 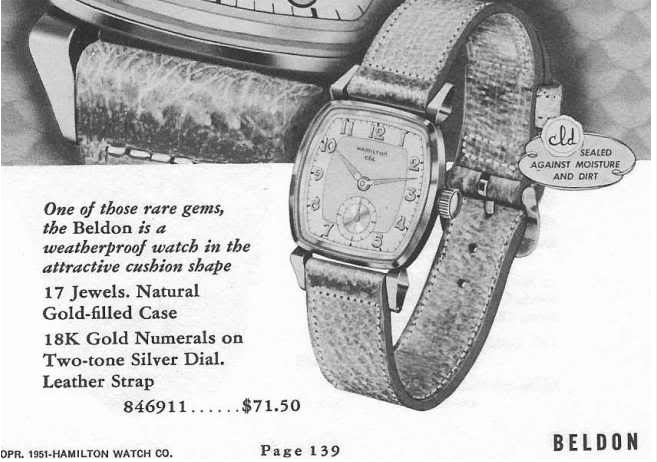 Like other CLD models in the 1950's lineup, the Beldon also included a reflector ring in between the crystal and the dial. The dial is sterling silver with a two tone white-butler finished pattern with 18K solid gold numerals. Under the hood you will fined an 8/0 sized, 17 jewel 747 movement. What crown would this take . I have the female piece of the 2 piece stem but the crown which came with the purchase had a crown which fit the stem but the inside diameter isnt wide enough to clear the case . Part number 184275 is the proper Beldon crown. You'll have to call around to parts houses like Barton&Chase, Ofrei, Casker, Twin City Supply, etc. but eventually you might find one.